And I like this new title. I do. You won’t see anything else like it this year. 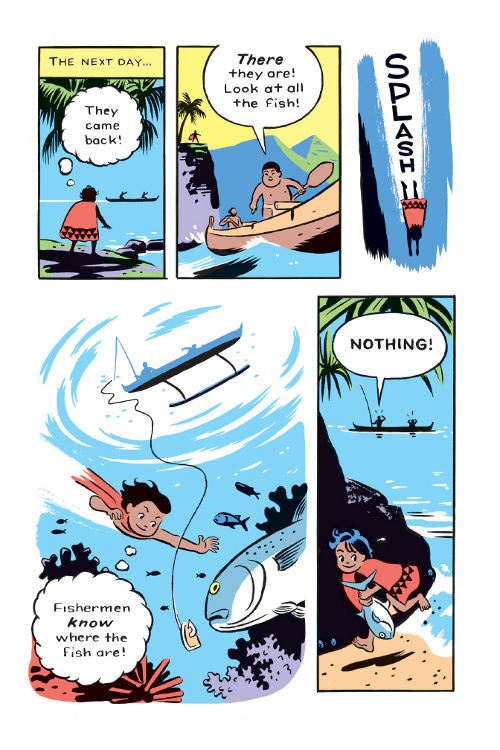 Graphic novelist R. Kikuo Johnson grew up in Hawaii on the island of Maui, according to his bio. 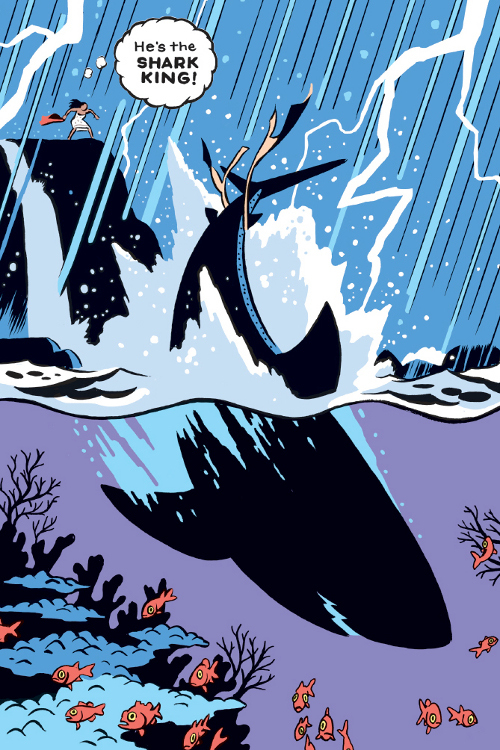 Evidently, native Hawaiians tell stories of a shape-shifting shark god, named Kamohoalii. 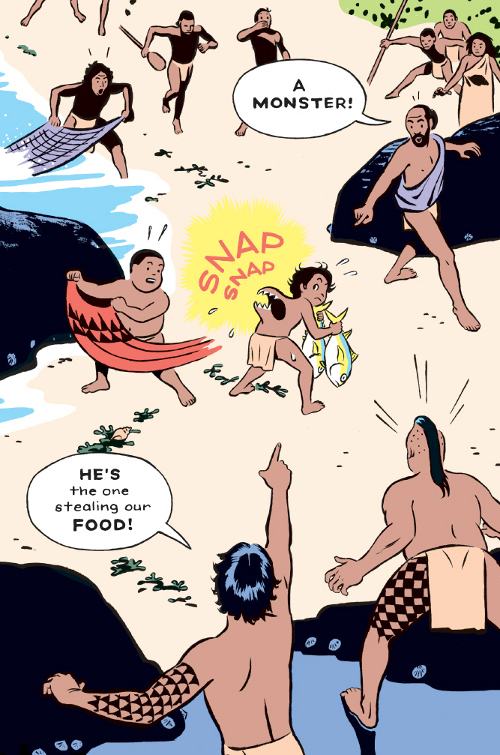 This new TOON comic, The Shark King, is Johnson’s version of one of those stories involving the shark god’s son, Nanaue. And I don’t want to give away the entire story, but I’ll say that it involves the shark god himself, of course (in this case, he’s called a shark king). 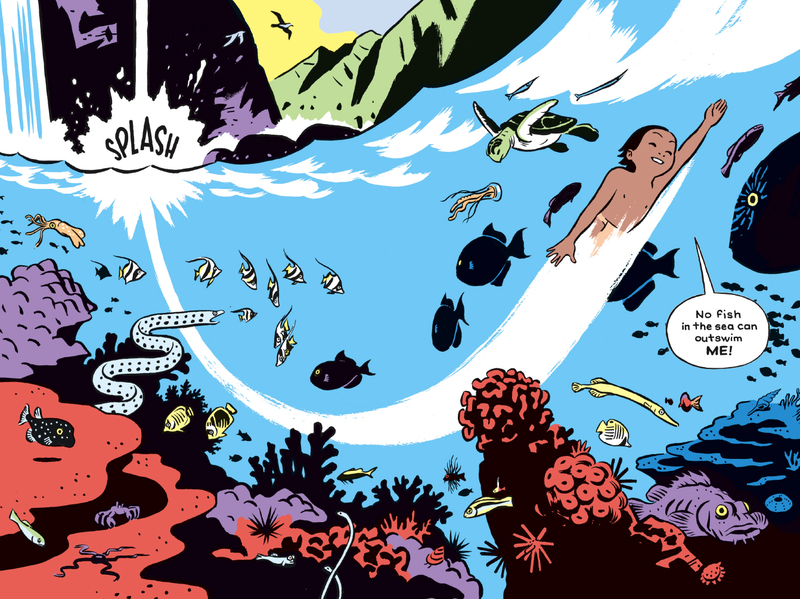 His young son, Nanaue, doesn’t know who his father is until the story’s close; the shark god leaves his human wife the night before their child is born, right as she discovers he’s the shark king. 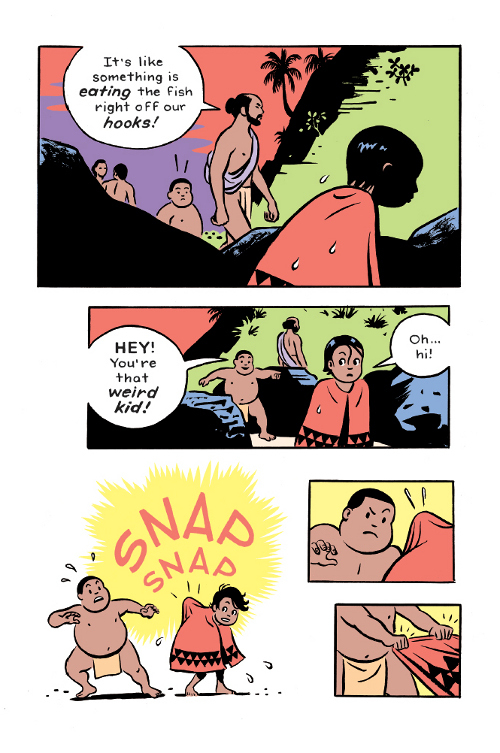 And Nanaue is born with a sharp-toothed shark’s mouth on his back (snap, snap), as you can see below. Needless to say, this makes it difficult for him to make friends. 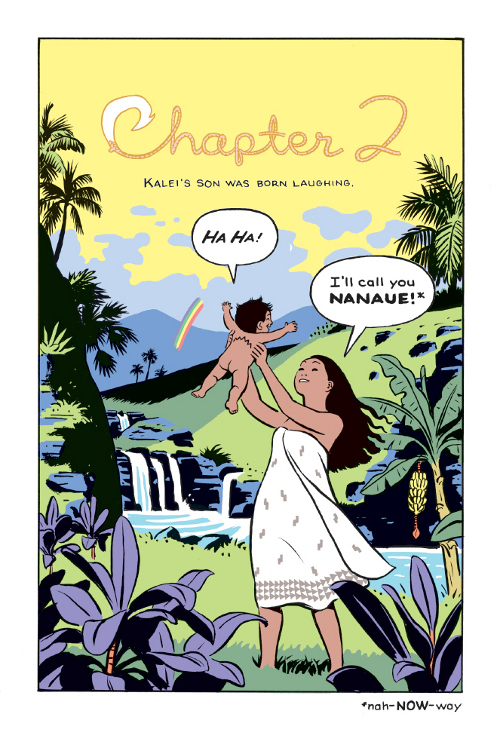 Nanaue is clever, a bit mischievous, and brave. When he is run out of his own village, he need not worry, given his god for a father had planned for such an event. And for his security. THE SHARK KING. Copyright © by 2012 by R. Kikuo Johnson. Spreads reproduced by permission of the publisher, TOON Books/RAW Junior, LLC, an imprint of Candlewick Press. I think kicks one to seven could easily be that on Friday night I saw The Lumineers in a tiny, hole-in-the-wall bar in Nashville, and it was one of the most fun live shows I’ve ever been to. For the love of all things special forever, if they’re ever in your town and you want to hear some fabulous, hand-clappin’, foot-stompin’, woo-oo, happy sing-along tunes, go hear ’em. “misfit children who struggle to find their place in their world” – love that line. I still feel that way sometimes. The wisdom of being a grown up is knowing that we all have our place in the world. 1. I got a great response to my blog post about the fear of failure that makes me feel like I am on the right track. 2. Got together with some old college buddies for an Avett Bros. concert. 4.Started reading Mrs. Peregrine’s Home for Peculiar Children. 5.Got a surprise visit from my sister just when I needed it. 6. Celebrated my father’s birthday with Friendly’s Vienna Mocha Chunk ice cream. 7. Little League!! My son’s team (the Red Sox) won their first two games. 1. My granddaughter has reached another milestone. She is now standing. 2. On Friday evening, I had dinner with Janet Wong and a very-pregnant Grace Lin at Upstairs on the Square in Cambridge, MA. We had the most amazing dessert–churros with a bittersweet dipping sauce. SOOOOOO delicious!!!!! 3. I invented a Poetry Month Martini. I make it with champagne mango puree, vodka, triple sec, freshly squeezed lemon juice, and simple syrup. It’s yummy. I should call it the “Julia” because my granddaughter LOVES when I puree champagne mangoes and feed them to her for lunch. As I was fixing her lunch last Wednesday, I looked at the puree and got the idea of creating a special cocktail for Poetry Month. Classic comics in the making! Thanks for this excellent post, and for featuring R. Kikuo Johnson, Jules! vexed in an exoskeletal shell? whorls its odd, segmented body? To hear me read the poem aloud, visit http://cracklesofspeech.blogspot.com/. What a fun book. I can’t Keep graphic novels on the shelf. JuLes, someday I am coming to Nashville. It’s on my list. Moira, love kick number 5. 1. Working on my haiku and photographybook redux. Am using createspace. 2. School play try outs done, we start rehearsing. 3. Continued responses to the poetry postcard project. Students are beaming. 5. Presenting at ‘The Gifts of Women’ at church today. 6. The Progressive Poem for National Poetry Month. Elaine, the poetry month martini sounds yummy. Steven, I love the first line. Janet Wong was telling Grace Lin and me about making books using Createspace last Friday. Good luck with your book project! That’s something that I need to do too. R. Kikuo Johnson: Thank you for sharing your story and your artwork with us. Three cheers for characters (especially real folks!) who are clever, brave, and daring – especially those that find joy in the world and laugh often! Jules: Now I’m singing pirate king lyrics from Gilbert & Sullivan’s The Pirates of Penzance and picturing it with sharks. 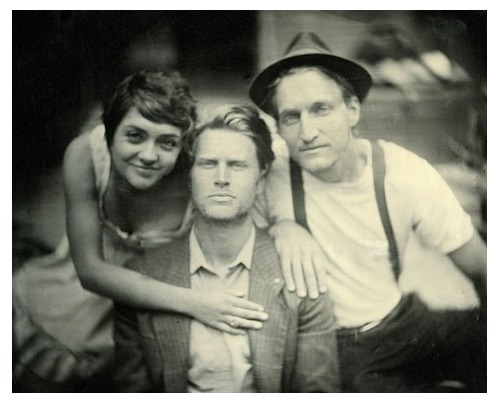 🙂 That picture of The Lumineers is lovely-old-fashioned. Moira: How sweet of your sister to visit! Congrats to your son and his team! Keep on keeping on. Elaine M.: Thumbs-up to your increasingly mobile granddaughter. Steven: Sounds like a fun week of art and writing. Jone: Yay for sunshine! Yay for rehearsals! Enjoy the poetry. Jules: I sometimes think your music-related kicks are the purest expression of what I like about 7-Imp. Then I read one in which you also manage to fold in something about your youngsters and have to reassess that narrow-minded view. Friendly’s, Moira!?! I thought they’d gone out of business — you mean they’re still around somewhere in the world? Yay! Elaine, took me a couple reads of your comment to understand that you weren’t feeding booze to your granddaughter. Whew. (Now I need a drink myself…) A Poetry Month Martini would be a perfect tropical breakfast cocktail! jone — thanks for mentioning CreateSpace… I hadn’t heard of it before. LW: a nonstop whirlwind, you are. The sequencing isn’t normal, but your 7 kicks trace the life cycle of a complete media project, from making up the words, through formal scripting, on into tryouts on stage and Web, and finally to film. Zowie! 1. We spent two nights in Miami this week — my first trip there. Didn’t see much of it (a business trip for The Missus), but it was cool to be someplace new and at least hypothetically exotic. 2. The occasion for the Miami trip was a benefit fundraiser for this organization (where The Missus works). A lot of tragic, outrageous, but also inspiring stories. 3. When we got back last night (after a 12-hour drive home), we were SO looking forward to just zoning out in front of the TV. Which… wasn’t working. Required just changing a projection lamp, though, an event which I’d prepared for years ago. (It did take me an hour to find the spare lamp.) Made me feel both manly and forward-thinking, two tingly sensations with which I’m generally unfamiliar. 4. Looking forward to resuming something like a normal online rhythm and life, after weeks of playing catch-as-catch-can. 6. Geek thrills: preparing to upgrade my computer’s operating system for the first time in several years. 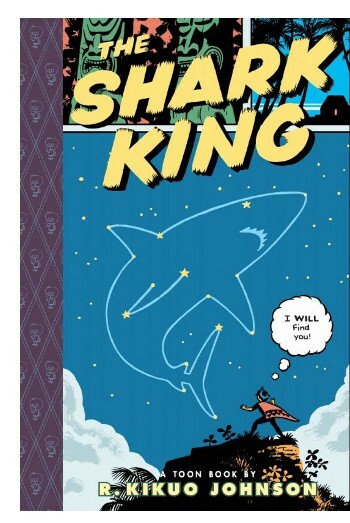 the shark king is on my list for me this week! i had it set aside but its moving up now. and that’s about it. one of these days (weeks) the kicks are gonna bust super-awesome, but for now it’s the little things. 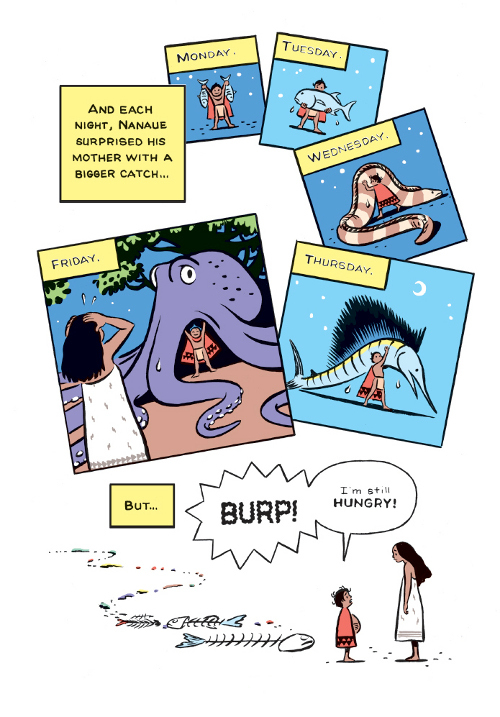 SHARK KING: Love that serpentine trail of fish bones leading to the BURP. And that boy’s genetic sharkiness gives a whole new meaning to the phrase “back teeth”. Jules – I’m still high on Lumineers’ video from last week with the creative dimmer-switch accompaniment. woo-oo. And your Gasp! 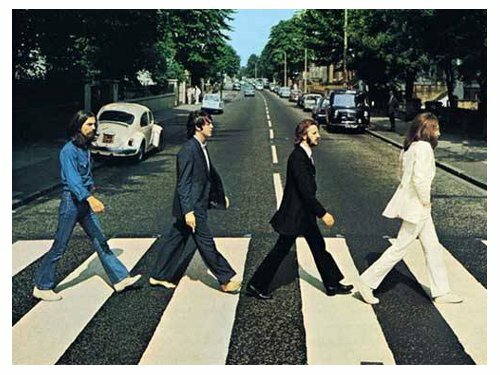 about ‘Abby Road forgotten’ made me laugh. A son of mine will sometimes mention “But, I’ve never seen Sound of Music.” which I react to with that parental Gasp! …and an immediate required-viewing session. Ha! Moira – Go Little League! I so miss those weekends cheering in the stands. Elaine – I’m gonna try your martini recipe. (thanks) Like JES I was confused about key ingredient and alcoholic intake of your granddaughter but wikipedia set me straight. Steven – “What god wrought the isopod,” stopped me in my tracks. Pill bugs rule! Jone – ditto appreciation for createspace mention. I envy your pending play rehearsals. LW – Break a leg! David – liked “not NOT a job.” I get it. 1) winning boxing match against difficult chapter (in round 9). 4) breakfast smoothy (or last-day-to-save overripe fruit.) Mmm! 5) character Mr. Bobo (Darwin’s chimpanzee butler) in Wallace & Grommit’s PIRATES. 6) totally hooked on SMASH; (like GLEE for grown-ups.) Man, those gals can sing. And choreography/dancers good too. Uma Thurman is having some childish-diva fun. 7) Reading boy books at moment: “Dead-in in Norvelt” is by my bed, “Hatchet” in my car. Yesterday I got to give a little speech to the winners of the OH branch of the Letters on Literature contest, where kids write to authors who have made a difference in their lives. Laurie Halse Anderson, Sharon Draper, Suzanne Collins–yes and hooray, but ALSO Emily Dickinson, Malcolm X, and Isaac Asimov. Beaming parents, book loving kids and did I mention cake? Heaven. Moira, I love the illustration that goes along with your failure post! Also, one day I wanna see The Avett Brothers live. I so very much do. … Happy birthday to your father! What a good week you had. Steven, best of luck with sending out your manuscripts/writing! Little Willow, break a leg on your auditions! Also, improv would terrify me, but I bet you rock at at it. Also: What John Said about your kicks. Wow. John: Your wife’s work must be rewarding. Also, kick #3 made me laugh outloud. Also, I LOVE BOTH THOSE PATTYs (the musicians, that is). I have a bunch of old Patty Larkin CDs, and I think I’ve seen Patty Griffin live more than any other musician. And, ooh, what a fun link you found, John, and I hope the one about The Shining is true. David, it’s always the little things, I think. Also, I didn’t know you had pneumonia. Glad you’re healthy now. And up and at ’em. Tricia: That is a most wonderful kick, indeed. Wow just wow. Do you know how Candlewick came to be involved with Toon books? Glad to see a post with this particular book – I saw it a while back on drawn.ca and was impressed then too! I also have no idea how your blog readers have so much time to write such thoughtful responses! Perhaps when our two year old is a bit older I will be able to remember seven things I did over the course of one week! Aaron, I don’t know the answer to that question, but I could always ask! what great kicks and poems and links. Too much for me to read tonight at 11pm PDT, but I will tomorrow. 1. US SCBWI national conference is here in LA in August!!!! I’m late checking this out, but I’m beside myself. And my hubby didn’t blink an eye when I told him the cost (yay!) AND its on my birthday weekend! 2. Repeated readings of Pete Seeger’s ‘Abyiyoyo’ with my almost 6-year old, repeated singing of the song, and repeated watching old Reading Rainbow episodes with Pete Seeger narrating the book. 3. Getting a MacBook Air (can hardly believe it!) tomorrow – partial payment for editing a book for a very sweet author. I’ve been a IBM compat. person all my adult life including when I did tech support, so I’m beyond excited about the generosity and the new technology in 5 lbs. 5. Finally got a post onto my blog after almost a month – I’m determined to get back on track this week after not writing for a month. Lovely doing my bedtime reading with you all! Allison: Good luck with that Mac, and congrats on kick #1! Love Julia Denos’s work. Thanks for the reply, Jules. I was going to boldly write and ask you what you think of her work! I bought a 2nd book for this little girl which I just noticed is ALSO illustrated by Julia Denos: I Had a Favorite Dress by Boni Ashburn which just tickles me from start to finish. I can’t wait to look at more work.